Someone asked me how we happen to have 6 cats. No, there is no way that I'd have kittens born here! They all came by way of of my soft heart (neurosis) for cats. Let's see... the first cat I ever owned after coming to Japan (our family had more cats than I can count when I was a child) was one that stayed with us for only a week or two. We found a half-dead kitten in the church yard... and though everyone else suggested we just leave it and let nature take its course, I had Tetsu take it to a vet... and it became ours. We lived in an apartment so weren't really supposed to have a cat but Tetsu arranged for a farmer friend in Northern Japan to take it and Tetsu drove three hours to deliver the cat there. (I think I was pregnant at the time). We had named the cat Sanji (3:00) because for the two weeks that we had it, it raced around the apartment at three in the morning. 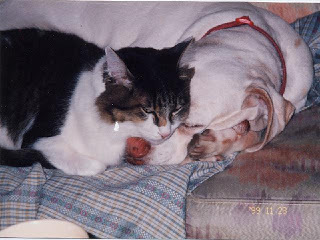 The next cat we owned was Lammy. Our American friends had picked up a kitten (that was destroying their house) and they were going back to the States anyway so we agreed to adopt the kitty as we'd just bought our house in Nikko (and we already had an old dog.) These friends gave us their dining room set and sofa set and wardrobes and curtains and air conditioners and refrigerator and book shelves. It was the least we could do to help them out and take their cat too. That kitty disappeared a year or so later... It was an indoor-outdoor cat. Takumi was especially sad about the disappearance of Lammy so we actually contacted a neighbor that had kittens and adopted Lemi. Lemi is our one and only cat we've ever "chosen". 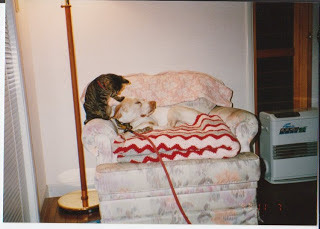 Lemi lived to a ripe old age (she was still with us when I started this blog) and was madly in love with our old dog. And then a month or two later I spotted a cat in the forest left with a can of cat food. Ding-dang-it! Someone has left a cat again!!! I tried to ignore it... but later in the day found it sitting on my outdoor slippers trying to stay warm. I gave in and left it some food and abandoned my home giving Tetsu an emergency phone call asking him to come and save me. We met at a restaurant and plotted out our plan. I was to stay away from the house for the rest of the day and if the cat was gone, not to think of it again. If it was still there then we'd take it on. It was still there (I'd given it food right?) and that was how Velvet became a member of our family. Hey! In this long narrative we've only gotten to ONE of our 6 cats that is still with us! One rainy morning Tetsu and I were out for our normal early walk and dang-it-all three kittens jumped out from a box set in the forest crying for help. I dissolved into a sobbing mass, Tetsu picked up the kittens and we headed home. A few weeks later one of the kittens found a home (by then I didn't want to give it up! I really am a case!) and we still have Cleo and Patora. This was about the time Zorro decided the feline population was getting crowded and left us. And then a year or two later I took Choco for a walk and when I brought her back there was a kitten by Choco's dog house. Again, someone had left it. Someone had TIMED it so that I would find it... It was too small to wander there, Choco was still thinking cats were enemies and would have gotten it in one gulp. I called Tetsu again and he cheerfully came home and burst into the house saying "Where is the new member of the family?" That was Chip and long time visitors will remember my blue days immediately after she joined our menagerie. And not long after that Toi joined us too. I had seen him in the neighborhood and tried to ignore him but one day I opened the front door and he just ran in and took a seat on the sofa. "I'm home!" he seemed to be saying. We now had Lemi, Velvet, Cleo, Patora, Chip and Toi. And Choco. Tetsu was beginning to say that 6 cats were too many! We weren't going to give up any, but Tanya, please refrain from helping any more cats. There is a limit. Let's concentrate on keeping the cats we have happy. Lemi passed on and then two years ago Mi arrived. And Tetsu, when he saw her outside, thought she was Chip escaped and picked her up, brought her in the house, nuzzled her awhile only to look down to see Chip staring up at him and this new cat. He put Mi back outside but Mi had decided that she'd found a wonderful new master and for the next two days meowed forlornly at the porch and looked in the windows. Of course, slightly deranged me was having a serious problem staying sane and so TETSU made the decision to keep Mi. "Mi is MY cat. You didn't adopt her. I take full responsibility." And that's how I've got 6 cats.